Coolgear's new USB Type-A to C incorporates a single unique screw lock mechanism on the “C” connector. The cable supports many application variations that include up to 5Gbps of data transfer and up to 3A max for power. The Cable can be used with a USB hub or other supporting device. Has a Unique single screw lock on the USB-C connector. Both 5Gbps data transfer and up to 3A powering can be used simultaneously. Can be connected with the screw lock mechanism engaged. Coolgear’s new USB 3.0 compliant Type-A to C Gen1 cable incorporates a single screw lock mechanism on the USB-C connector. The single screw lock cable is a Type-A male to Type-C male 0.5 meter long (19.68 inches) cable. The single screw lock cable supports up to 3A max power for devices. Examples of application use for this single screw lock cable. Using a USB wall charger, desktop charger, or high powered battery bank, the cable can charge devices requiring up to a 3A power. This means laptops, notebooks and tablets can receive their maximum power through the cable via the source connection. Can be used as an upstream or downstream cable with an intermediate device such as a USB Type-C or Type-A hub. Uses a single screw lock mechanism to secure the Type-C connection. Can carry 3A max of power to devices from an appropriate power source. 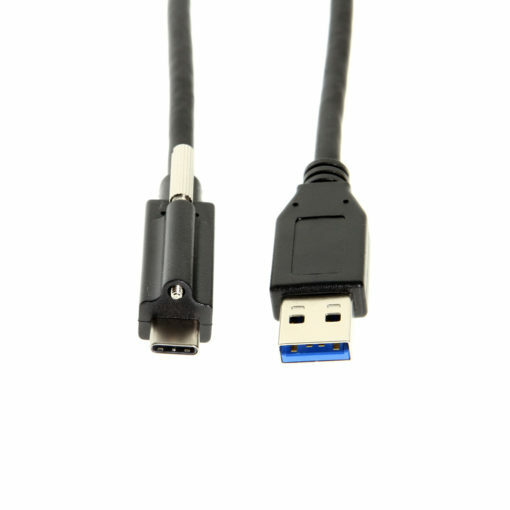 0.5 meter cable length for close connections from host or power source to device. This single screw lock Type-A to C cable is also available in a 1 meter length (39.37 inches).